Dresden was one of the musical centres of Germany. In the first half of the 17th century Heinrich Schütz played a key role and was considered the father of German music. Around 1700 saw the start of a particularly glamorous period, when the court was inspired by the splendour of the French court under Louis XIV. The chapel in Dresden developed into one of Europe's best ensembles, much admired by some of the leading composers, including Johann Sebastian Bach. He was envious of the quality of the members of the chapel which was partly the result of their being allowed to concentrate on one single instrument. It was a truly international group: in the chapel musicians from France, Italy, Bohemia and Germany played together. Equally international in character was the repertoire. Music by Vivaldi and other Italian composers was frequently played, but there were also orchestral overtures in the French style, and music by some of the best German composers, such as Telemann and Fasch. This is not the only composition which was edited by Pisendel. The Overture in D by Handel is another; in this case he added two movements by an unknown master. The inclusion of this piece by Handel may surprise as he composed his large-scale vocal music almost exclusively for England. However, this overture was part of a collection of six which was printed by John Walsh and found its way into Schranck No. 2. Pisendel not only extended the piece but also added parts for two flutes which are given independent roles in one of the added movements. In the overture Handel makes use of music by his colleague and friend Telemann: the leading motif of the allegro is taken from the third Production of his Musique de table. Brescianello is a composer of Italian origin who worked most of his life in Germany. His compatriot Caldara was for many years court composer in Vienna. His Sinfonia in C has opulent scoring for strings, trumpets, oboes and bassoons. It is very different from a piece like the Sinfonia in D which was written by Hasse as the overture to his opera Demofoonte. The inclusion of these two pieces documents the stylistic changes experienced during the first half of the 18th century and bears witness to the fact that the court chapel in Dresden followed the fashion of the time closely. This disc presents a very small selection from a huge collection which includes about 1800 manuscripts. 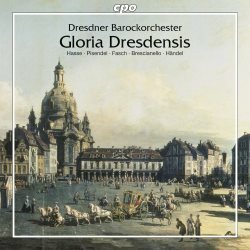 This is not the first recording with music from the Dresden court; in the past ensembles such as Musica Antiqua Köln and the Freiburger Barockorchester also performed and recorded repertoire from Dresden. I don't know which pieces from this disc have been recorded before; at least Pisendel's Sonata in c minor is available in several other recordings. The performances are generally quite good, and that goes especially for the pieces in large scorings, such as those by Caldara and Handel's movements from the Overture in D. In some other pieces the sound is sometimes a bit too thin, lacking the opulence and brilliance of, for instance, the other ensembles mentioned above. There could have been stronger dynamic accents and the palette of orchestral colours is too narrow.